MCE RT Master Mix for qPCR is a convenient, ready-to-use formulation for reverse transcription. The 2× Super RT Mix contains all the reagents necessary for first-strand cDNA synthesis. With RNA added, the optimized system will provide sensitive and reliable cDNA synthesis. 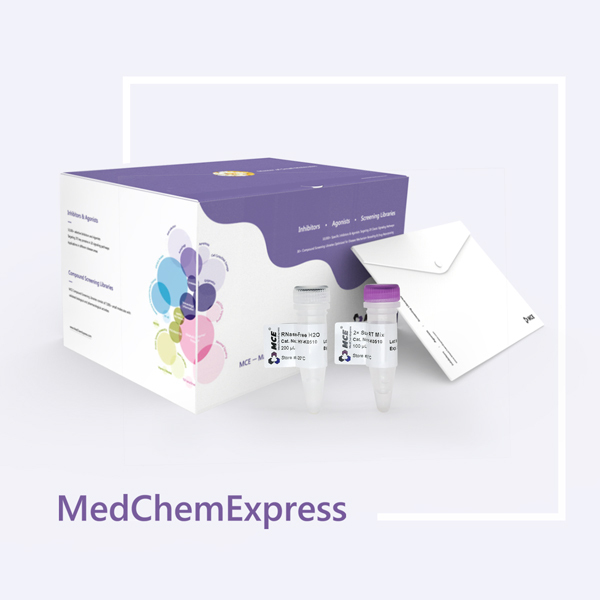 Upon completion of the first-strand cDNA synthesis, the cDNA product can be directly applied as a template in a standard PCR and qPCR. MCE SYBR Green qPCR Master Mix (HY-K0501) is highly recommended for detection of the expression levels of interested genes. • Only one transfer step reduces handling errors significantly. • Super-efficient reaction even with low template amounts (total RNA: 5 ng-5 μg in a 20 μL reaction). 1 Thaw RNA templates and the 2× Super RT Mix on ice. Mix solutions gently but thoroughly. 2 Prepare the following reaction mixture in a PCR tube on ice. b. Stop the reaction by heating at 85ºC for 2 mins followed by chilling on ice.